The second largest city in Peru and probably its most handsome, Arequipa maintains a distance from the capital Lima not only geographically but also culturally. Arequipinos feel themselves distinct from the rest of Peru, and resent the centralised power of Lima. It certainly looks distinctive, with an elegant historic centre built almost entirely of a white volcanic stone (“sillar”) that gives rise to its nickname “the white city”. Encircled by three snowcapped volcanoes, and enjoying almost perfect weather (300 days of sunshine, low humidity), it’s a wonderful city in its own right and the ideal gateway to the spectacular Colca Valley. 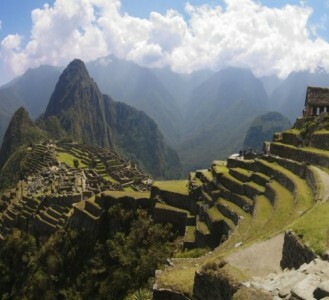 Its name, incidentally, is derived from a Quechua phrase meaning “let’s stop here”. We think you’ll agree it’s an appropriate name. Despite two disastrous earthquakes in 1687 and more recently in 2001, its fortunate that Arequipa still has fine colonial churches and mansions, and the grand Plaza de Armas as its focal point – in many people’s eyes the loveliest main square in all of Peru. It is dominated by the huge 17th Century cathedral, which despite being badly damaged in the 2001 earthquake has been so well restored you would never know. Just off the plaza opposite the cathedral is La Compania, a 17th Century Jesuit church which took more than a century to build – and when you see the elaborate carved façade and magnificent portal, you’ll begin to understand why. The equally detailed altar is completely covered in gold leaf. To its left, the San Ignacio Chapel is remarkable for its cupola smothered in unusual jungle-like murals. Another of Arequipa’s religious architectural marvels is the Monasterio de Santa Catalina, a labyrinthine convent complex – a world within a world behind its thick walls. Away from central Arequipa, about a 25 minute walk, are the attractive suburbs of Yanahuara and Cayma, both places where you can get relief from Arequipa’s intense sun as well as wonderful views. Relax on a bar terrace in Plaza de Yanahuara and take in the superlative vista of El Misti volcano. What’s not to like?! After a night in Arequipa your itinerary will take you on an unmissable trip to the Colca Valley. The first leg of the tour finishes with an overnight stay in Chivay. Along the way you’ll pass some simply stunning volcano scenery as you head towards the open plains of Salinas and the Pampa Canahuas Vicuna Reserve The Vicuna is the rarest of the camelid species, an ancestor of the Alpaca and the source of the world’s finest and most expensive wool fleece. Continuing to ascend the highlands you pass numerous scenic wetlands teeming with birdlife, before reaching the highest pass at Patapampa (4,900 metres). From here the volcano vistas are simply breathtaking. However because the air is so thin at such altitude you may be literally quite short of breath, so from here we will gradually descend to the overnight destination of Chivay at the more comfortable altitude of 3,600m. Chivay is a charming and very friendly little town with the lion’s share of the restaurants and hotels in the region. But we’d advise against staying out too late after dinner at the hotel, because the following day it’s an early morning start to go and see one of wildlife’s most stunning spectacles… the giant Andean Condor, close-up and in full flight.